I found this recipe this week and thought it sounded a little strange, but still wanted to try it. This is my Great Taste For the Week! I was worried it wouldn't be liked, but my husband loved it! A different way to serve Lasagna! Try it and see if you like it. *Note: can be cut in half if it needs to be. Brown your ground beef; drain thoroughly and add the cumin, chili powder, garlic powder, red pepper, salt, pepper and tomatoes. Heat through. Pour half of the beef mixture in the bottom of a 13x9 inch baking dish. 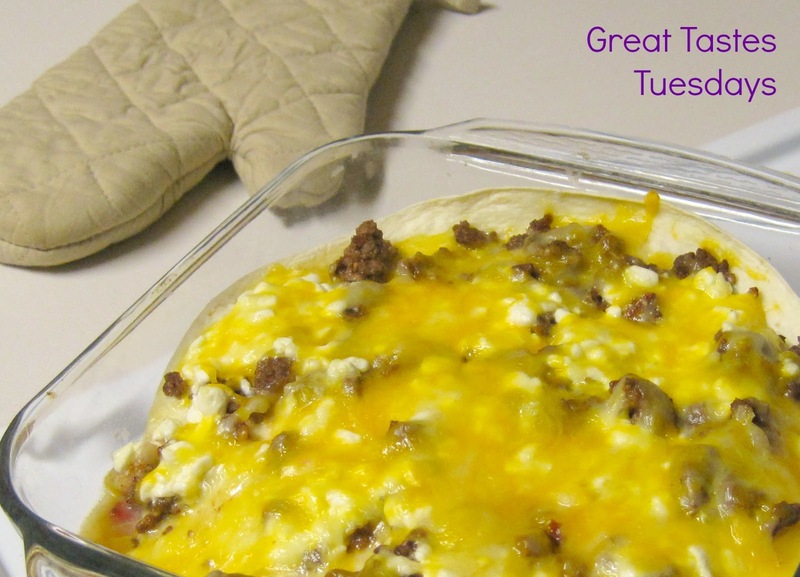 Mix the cottage cheese, Monterrey Jack cheese and egg together, put half of the mixture over the meat. Layer the tortillas and cover as completely as possible. Repeat these layers until all of your mixture is gone. Oh this looks tasty!! Pinning now! Can't wait to try it! I'm following you too! Come check out my blog if you get a chance! Hope you're having a wonderful week so far! I'd love for you to link up at my weekend party @The Weekend re-Treat! on The Best Blog Recipes!